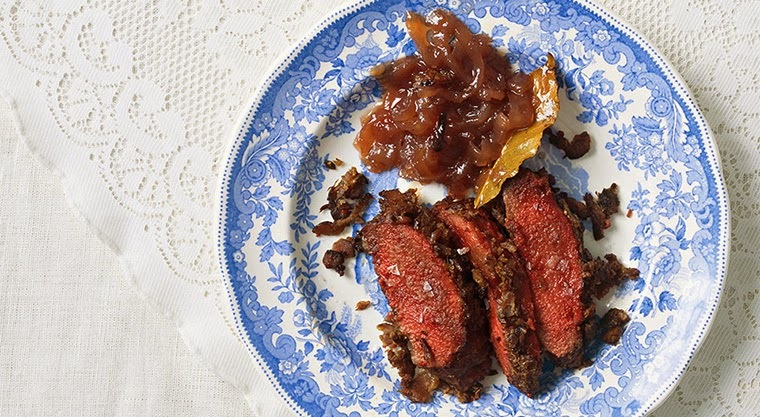 While we’re not going to feature Manus’s mother’s ostrich giblets recipe, we do have his recipe for Springbok fillet with a biltong crust, served with onion marmalade. Just the idea of it gets our mouths watering. 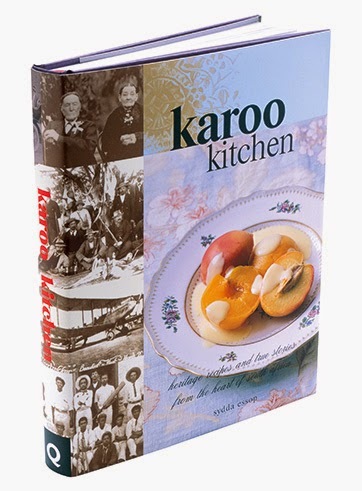 Karoo Kitchen is available from all good bookstores and online retailers. Preheat the oven to 160 C. Season the meat with salt and black pepper to taste. Roll the fillet in flour, then in beaten egg and finally in biltong. Oven roast for 15-20 minutes until the meat is cooked on the outside but still pink inside. Wrap in tinfoil and leave to rest in the warming oven for 10 minutes. Meanwhile, to make the onion marmalade, stir-fry the onions in olive oil until soft. Add the red wine vinegar, bay leaves, cloves and sugar. Bring to the boil, turn down the heat and simmer until the liquid has been absorbed. Add the red wine and allow to cool until the mixture has become sticky. Heat a cast-iron ridged pan until it is smoking hot and pan-fry the fillet quickly on both sides. 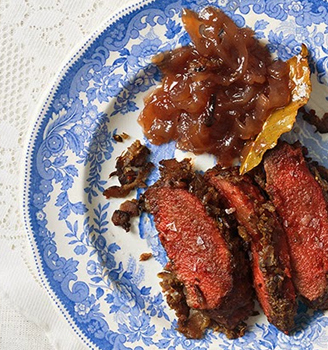 Cut the fillet in portions and serve with onion marmalade.